Leading experts in breast reconstruction and breast aesthetics. »Breast« is a simple word, but in the mind of a plastic surgeon, it conjures a myriad of images. Thoughts of shape and symmetry, contours and size and beauty and disfigurement come to mind. It is said that only a few women are satisfied with the appearance of their breasts. We understand that the breast surgery journey is filled with many emotions. This is why we want to ease your mind about your decision. Everything you need is right in front of your eyes. Visit our Your new Breast section now. 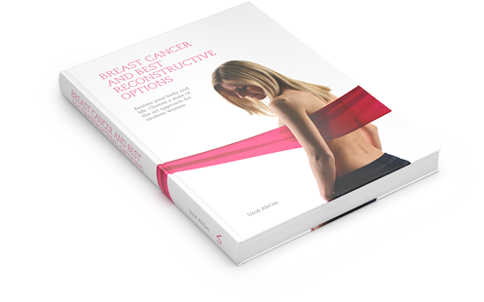 Everything you should know about breast reconstruction is just one click away. A modern book that includes all the correct professional information, a picturesque combination of history, art, the possibilities of modern medicine, and confessions of patients who were ready to share their stories and their bodies, personal view and optimism. The decision for plastic surgery is very personal, and the results can be life-changing. Whether you are considering plastic surgery for reconstructive reasons due to cancer, trauma or a congenital disorder or simply to enhance your appearance, please use our online diagnostic tools. With our user-friendly online diagnostic tools, there is no need for your initial office visit. All the important information and details can be given to you in the comfort of your home, which makes the whole proces quicker and lighter on your wallet. The Lisca post-operative underwear line Breast Help by prof. Uroš Ahčan features bras that are adapted to the specific needs of women who have undergone breast reconstruction, aesthetic breast surgery or abdominal surgery. They are designed to make the patient's recovery and daily life as easy as possible.